Plum is the common name for various trees or shrubs with smooth-skinned stone fruit in the genus Prunus of the rose family (Rosaceae), and specifically those plants comprising the subgenus Prunus with the apricot (P. armeniaca). Plums are characterized by shoots with a terminal bud and solitary (not clustered) side buds, and by a fruit with a fleshy edible outer part with a groove on one side enclosing a smooth shell (stone) that encloses a seed. The word plum also is used for this fruit (a drupe). Furthermore, the term plum sometimes is used as a general term for any of the species of the genus Prunus, a taxonomic group that also includes peaches, cherries, and bird cherries. Plums (the tree and the fruit) provide various values. Ecologically, plum trees provide flowers for pollinating insects and fruit to be eaten by animals. For humans, they provide a healthy source of food that is also delightful to the senses of taste and touch. In addition, plum trees are often planted as ornamental trees, with various species treasured for the color of their leaves and their showy and delicate flowers. Numerous varieties of plums have been developed for different types of fruit, growing characteristics, and so forth. Prunus is a genus of plants in the family Rosaceae. Rosaceae is one of the largest families of flowering plants with about 3,400 species, including apples, berries, peaches, plums, cherries, the hawthorn tree, the mountain ash, and many others. 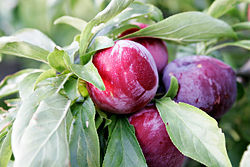 The genus Prunus includes the plums, cherries, peaches, apricots, and almonds. There are around 430 species of Prunus spread throughout the northern temperate regions of the globe. The Prunus subgenus, which includes the apricots and plums, is distinguished from other subgenera (peaches, cherries, bird cherries, etc.) in the shoots having a terminal bud and the side buds being solitary (not clustered), the flowers being grouped one to five together on short stems, and the fruit having a groove running down one side, and a smooth stone. The fruit of a plum is a drupe. A drupe is a fruit in which an outer fleshy part (exocarp, or skin; and mesocarp, or flesh) surrounds a shell (the pit or stone) of hardened endocarp with a seed inside. These fruits develop from a single carpel, and mostly from flowers with superior ovaries. The definitive characteristic of a drupe is that the hard, lignified stone (or pit) is derived from the ovary wall of the flower. Other fleshy fruits may have a stony enclosure that comes from the seed coat surrounding the seed. These fruits are not drupes. In addition to plums, some flowering plants that produce drupes are coffee, jujube, mango, olive, most palms (including date, coconut and oil palms), pistachio and all members of the genus Prunus, including the almond (in which the mesocarp is somewhat leathery), apricot, cherry, nectarine, and peach. The term stone fruit (or stonefruit) can be a synonym for "drupe" or, more typically, it can mean just the fruit of the Prunus genus. The fruit of plums all have smooth and deeply colored skin, which can be yellow, green, indigo blue, purple, red, and anything in between (Herbst 2001). They may be round or oval shaped and range in size from one to three inches in diameter (Herbst 2001). The fruit Prunus armeniaca (apricot) gained its name from the beliefs of Pliny the Elder, a Roman historian and scientist of the first century, who maintained that the apricot was a kind of a plum, and had originally come from Armenia (Petrosian and Underwood). Armenian sources support their claims by referring to a 6,000-year-old apricot pit found in an archaeological site near Yerevan (Petrosian and Underwood). Other historians point that Mesopotamia as a clue to the Latin name. Apricots were cultivated in Mesopotamia, and it was known as armanu in the Akkadian language. Sect. Prunus (Old World plums). Leaves in bud rolled inwards; flowers one to three together; fruit smooth, often wax-bloomed. Sect. Prunocerasus (New World plums). Leaves in bud folded inwards; flowers 3-5 together; fruit smooth, often wax-bloomed. Sect. Armeniaca (Apricots). Leaves in bud rolled inwards; flowers very short-stalked; fruit velvety. Treated as a distinct subgenus by some authors. Plum and sloe output in 2005. There are many species of plums and hundreds of varieties that are cultivated throughout the world, with most placed in two categories: Japanese (which originated in China) and European (Herbst 2001). For example, Prunus domestica is of European origin or southwest Asia and Prunus salicina, the Japanese plum, is of Chinese origin. Blackthorn or sloe is Prunus spinosa and is a common European species (Bender and Bender 2005). Japanese plums tend to be the larger of the two and have a juicier, softer flesh, while European plums are particularly well-suited to drying and cooking (Herbst 2001). There are also species of New World origin such as Prunus americana. 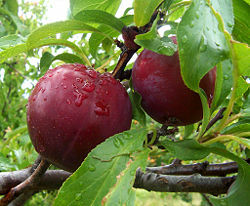 However, while these were utilized by Native Americans, most cultivated plums in the United States are of the Japanese or European variety, such as P. salicina. Plums come in a wide variety of colors and sizes. Some are much firmer-fleshed than others and some have yellow, white, green, or red flesh, with equally varying skin color. When it flowers in the early spring, a plum tree will be covered in blossom, and in a good year approximately 50 percent of the flowers will be pollinated and become plums. Flowering starts after 80 growing degree days. Plums are most commonly planted in temperate zones. If the weather is too dry the plums will not develop past a certain stage, but will fall from the tree while still tiny green buds, and if it is unseasonably wet or if the plums are not harvested as soon as they are ripe, the fruit may develop a fungal condition called brown rot. Brown rot is not toxic, and very small affected areas can be cut out of the fruit, but unless the rot is caught immediately the fruit will no longer be edible. Plum fruit is sweet and juicy and it can be eaten fresh or used in jam-making or other recipes. Plum juice can be fermented into plum wine; when distilled, this produces a brandy known in Eastern Europe as Slivovitz, Rakia, Tzuica, or Palinka. Dried plums are known as prunes. Prunes are also sweet and juicy and contain several antioxidants. Prune marketers in the United States have, in recent years, begun marketing their product as "dried plums," because "prune" has negative connotations connected with elderly people suffering from constipation. Various flavors of dried plum are available at Chinese grocers and specialty stores worldwide. They tend to be much drier than the standard prune. Cream, Ginsing, Spicy, and Salty are among the common variety flavors. Licorice is generally used to intensify the flavor of these plums and is used to make salty plum drinks and toppings for Shaved Ice or baobing. Pickled plums are another type of preserve available in Asia and international specialty stores. The Japanese variety, called umeboshi, is often used for rice balls, called "Onigiri" or "Omusubi." The ume, from which umeboshi are made, is however more closely related to the apricot than to the plum. Plums and prunes are known for their laxative effect. This effect has been attributed to various compounds present in the fruits, such as dietary fiber, sorbitol (Roach 1999), and isatin (Innvista). Prunes and prune juice are often used to help regulate the functioning of the digestive system. The plum (Serbian: шљива / šljiva) and the alcoholic drink slivovitz (Serbian: шљивовица / šljivovica) are both very popular in Serbia, where plum production averages 424,300 metric ton per year. A large number of plums are also grown in Hungary where they are called szilva and are used to make lekvar, a plum paste jam, palinka a slivovitz-type liquor, plum dumplings, and other foods. The region that produces the most plums is Szabolcs-Szatmár in the northeastern part of the country near the borders with Ukraine and Romania. Plum is used as a food plant by the larvae of some Lepidoptera including November Moth, Willow Beauty and Short-cloaked Moth. Innvista. Plums Innvista. Retrieved January 3, 2008. Petrosian, I., and D. Underwood. 2006. Armenian Food: Fact, Fiction & Folklore. Bloomington, IN: Yerkir Publishing. ISBN 9781411698659. Roach, M. 1999. The power of prunes Salon.com. November 5, 1999. Retrieved January 3, 2008.